As I’m sure I’ve mentioned countless times already, I really dislike shopping in stores these days, especially if I can get what I’m looking to buy online and shipped right to my door. Sadly, there have been some things that you just needed to buy in store like perishables and every day essentials such as toilet paper, paper towels and detergent. Sure, you could buy them online…if you wanted to pay half the price of the goods in shipping too! Thankfully all that has changed with Walmart.com and the Walmart app. I love shopping online, and these days even more so from my phone. I know it sounds terrible, but when you think of a few items you really want to order and life gets in the way, sometimes I forget what I wanted by the time I get to pulling out the laptop or having time to sit in front of the computer. So, it’s super handy to be able to open an app on my phone and quickly purchase what we need right then and there. That’s why I was super happy to have such a good experience with the Walmart app recently. 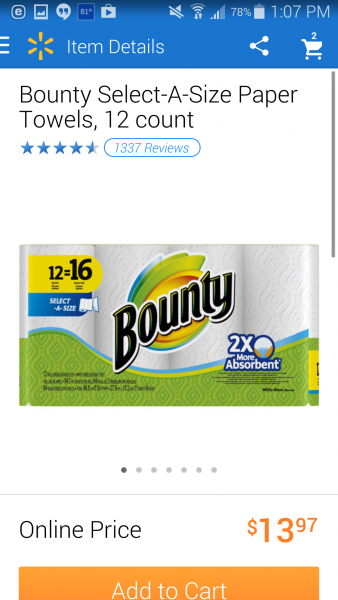 I noticed the other day that we were starting to run low on detergent and paper towels, so I decided to give a quick look on the Walmart app to check out the pricing. I saw that the pricing was very similar to what we paid in stores, even the P&G brands that we prefer. It also meant that I wouldn’t have to get pretty-fied nor use up gas, which I’m a bag fan of. Plus, I didn’t even have to pay for shipping as long as I spent at least $50 or picked up the items at our local Walmart while I was running other errands. Count me in. Some shopping apps can be a bit rough to use, but the Walmart app was honestly exceptionally smooth. I like that on the main screen you can see the value of the day, see what products recently got reduced in price, check out the weekly ad and a whole lot more. Searching and adding an item to your cart is very simple as well. 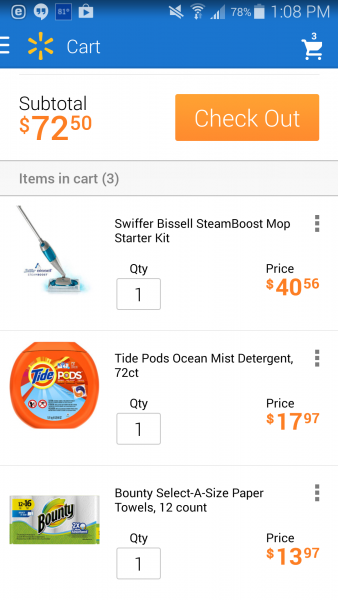 I added the Bounty Paper Towels and Tide Detergent Pods to my cart in under a minute and also saw a great price on the Swiffer Bissell SteamBoost Mop I’ve been eyeing, so I added that too. Then, I just signed into my Walmart account and completed my purchase right in the app without any trouble. I liked that part of my shipment shipped early and was received just a couple days later. Unfortunately, part of my shipment still hasn’t shipped yet after a week, but I am sure that it has to do with availability. But, that just makes me all the more glad that Walmart will ship in multiple shipments so you don’t have to wait. 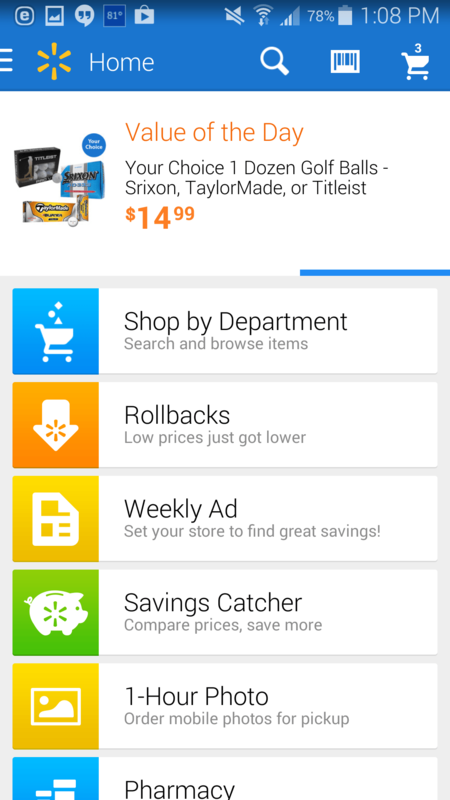 Want to check out shopping online at Walmart.com or with the app yourself? One lucky Smart Savvy Living reader is going to win a $25 Walmart Gift Card just for that! Entrants must be 18+ and a legal resident of the 50 United States + DC. All entries must be completed on the Rafflecopter widget below; please allow a moment for it to load. All entries are optional, but odds of winning increase with number of entries completed. Giveaway will run through 11:59 PM ET 8/20/14. Winner will be contacted via email and have 24 hours to claim their win. All prizes and shipments are the responsibility of the sponsor, not Smart Savvy Living. Please see Rafflecopter widget for full terms. I am in love with Tide pods and use tons of them with 3 boys. Thanks so much for the chance !! The P&G product I would buy with the gift card would be Tide products. If I won, I’d buy Bounty and Tide. I am out of detergent so I would buy some Tide Pods. most likely some bounty paper towel and some tide laundry soap always need that ..